NETWORK FINALS: GOTHAM gained 0.1 in final numbers, while QUANTICO and the SCORPION rerun fell 0.1. One of TNT’s NBA PLAYOFFS games topped Monday cable (Golden State vs. Portland at 1.66), with the other game at 1.23. Between the two was VH1’s LOVE & HIP-HOP, down 0.11 to 1.47, with lead-outs BASKETBALL WIVES down 0.23 to 1.04, and TI & TINY at 0.87 compared to last week’s 1.16/1.14. USA’s WWE telecast was at 1.05/1.04/1.00, compared to last week’s 1.22/1.18/1.17. On Discovery, STREET OUTLAWS ticked down to 0.94, and VEGAS RAT RODS returned at 0.54. 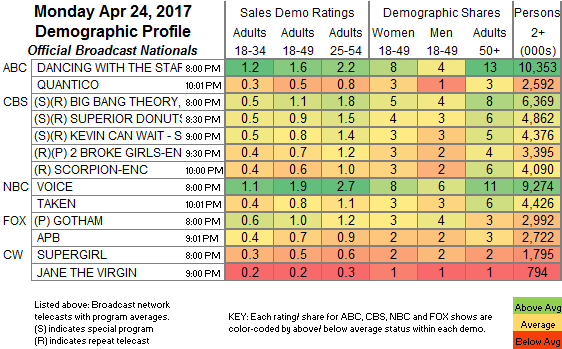 On TBS, AMERICAN DAD was steady at 0.53, and ANGIE TRIBECA was down 0.05 to 0.25. AMC’s BETTER CALL SAUL edged down 0.02 to 0.52. On Bravo, SOUTHERN CHARM rose 0.08 to 0.51, and SWEET HOME OKLAHOMA was up 0.05 to 0.26. On MTV, TEEN MOM dropped 0.17 to 0.50, with the AFTER-SHOW down 0.09 to 0.38. 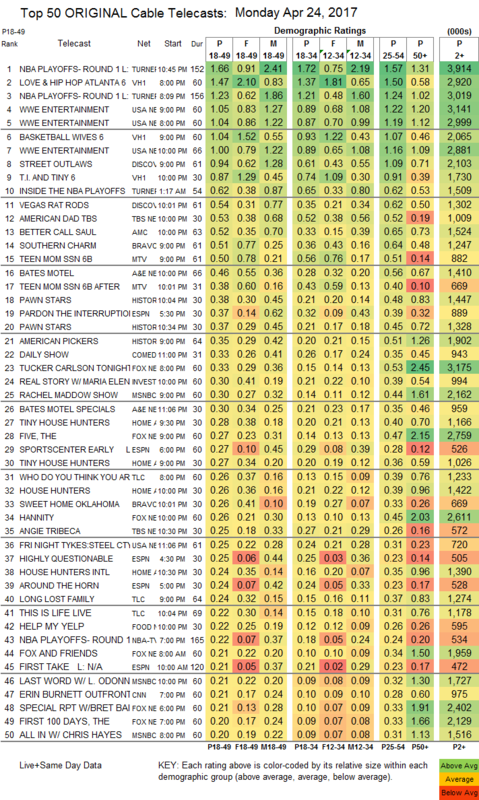 On History, PAWN STARS was at 0.38/0.37, compared to last week’s 0.35/0.33, and AMERICAN PICKERS was up 0.09 to 0.35. On HGTV, TINY HOUSE HUNTERS was at 0.28/0.27, compared to 0.33/0.29, HOUSE HUNTERS was down 0.07 to 0.26, and HOUSE HUNTERS INTL was at 0.25. TLC’s WHO DO YOU THINK YOU ARE was at 0.26, LONG LOST FAMILY was at 0.24, and THIS IS LIFE wat at 0.22. Food Network’s HELP MY YELP was at 0.22. On Freeform, BABY DADDY dropped 0.04 to 0.15, YOUNG & HUNGRY was at 0.14, and THE TWINS fell off the chart, down 0.01 to 0.05/111K.